Some common types of cracks are superficial and require no intervention while other cracks can eventually lead loss of your tooth. A cracked tooth can cause a wide variety of symptoms. The movement along the crack irritates the nerve of the tooth. If cracks and fractures are left untreated they can allow bacteria from your saliva to penetrate the tooth and cause infection. At our office, we will thoroughly evaluate your tooth to determine if endodontic treatment is necessary. 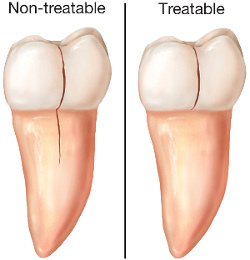 Sometimes a fractured tooth will only need the added protection of a crown, which would be done by your dentist. How Can I Tell If My Tooth Is Cracked? There is wide variation in cracked teeth with each one given the patient different symptoms. You may experience erratic pain when chewing, pain on release of biting, or pain when your tooth is exposed to extreme temperatures. The pain may come and go. In the early stages there may be difficulty in locating which tooth is causing the discomfort. Larger cracks become easier to locate. If you think you are experiencing a cracked tooth discuss it with your dentist. If he/she suspects a cracked tooth you will likely be referred to us for a detailed consultation using microscope and CBCT to determine your treatment options. What Technologies Are Being Used To Find And Treat Cracked Teeth? In addition to digital radiography, we utilize special operating microscopes. Magnification and illumination are helpful in aiding the doctor to see tiny details inside your tooth, including fractures. Also, a camera on the microscope can record images of your tooth to further document the doctor’s findings. This new technology allows complete 3D visualization of the teeth and bone with ultra low radiation exposure. While not used in every case, when it is needed it can provide unmatched diagnostic information. If a fracture is too small to be seen on the CT Scan, we can still use the CT Scan identify other clues that will help determine if your tooth is fractured. This allows us to make the most accurate treatment planning decisions before we ever start working on your tooth. When Should I See My Dentist After Root Canal Therapy On A Cracked Tooth? It is especially important that you call your restorative dentist as soon as possible to make your follow-up appointment. With a fractured tooth, it is recommended that you have a crown placed very soon, less than 4 weeks, after root canal treatment. This step is imperative for the long-term prognosis of your tooth as the crown will help to stabilize the fracture. A cusp is the pointed part at the corners of the chewing surface of your tooth. If this becomes weak, the cusp may fracture. Part of the cusp may break off or may incompletely fracture and may need to be removed by your dentist. A fractured cusp rarely damages the pulp and therefore usually does not require root canal treatment. Your dentist or Dr. Tigrett will need to evaluate your tooth to determine the best course of action. With prompt care your tooth can usually be restored by your dentist, needing only a crown. This type of crack extends from the chewing surface of the tooth vertically towards the base and the root. Due to the location of the crack, damage to the pulp (nerve) of the tooth is common. Endodontic treatment is usually needed to treat the damaged pulp. We will then closely evaluate your tooth through the microscope to determine the extent of the crack. If the prognosis is good endodontic treatment will be completed. A crown will then be placed to protect the cracked tooth. At times, the crack may extend below the gingival tissue. In those cases the long-term prognosis of your tooth is not good. We will review the alternative options available to you; which may include removal of the tooth and replacement with a bridge or dental implant. Although we do not typically remove the tooth in our office, we'll will work with your dentist to guide you through the process. Vertical root fractures are rare but can occur in teeth that have had previous endodontic treatment. Vertical root fractures are cracks that begin deep in the root and extend toward the chewing surface. In some limited cases the tooth can be maintained by removing the damaged portion of root. Extraction of the tooth is usually recommended.